The Glen of Aherlow (the valley of the River Aherlow) extends about 15 miles from Bansha in the east to Galbally in the west and is between the Galty Mountains and the Slieve na Muck hills. The Coach Road provides a beautiful view of the area from from the statue of Christ the King, which was erected by the local community. The church of Christ the King is located in Galbally. This route was used by Bianconi's Coaches which were the first to offer public transportation in Ireland. The glen was an important pass between Tipperary and Limerick, and became a hideout for the "Raparee", the Irishmen who were dispossessed of their lands and became outlaws. 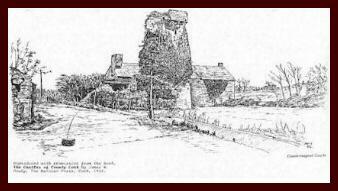 See our Family Research page for more information and photos of the Galbally church. "Originally Magnel. 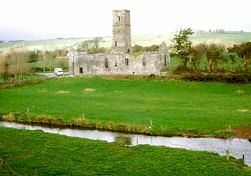 Castlemagner in Co. Cork was formerly Magnelstown. Many Magnels were in Co. Cork in the thirteenth century as is known from the Justiciary Rolls; and it is where families of the name have been associated ever since. It had become Magner by the sixteenth century and is numerous in the Tudor Fiants. In the next century it is found listed in the "census" of 1659 as a principal Irish name in the Co. Cork barony of Kilmore and Orrery; and three years earlier two of the name were transplanted as Papists from Co. Cork to Connacht. Maingnéir is the Irish form of this name." Edward MacLysaght, More Irish Families. Dublin, 1996, page 151. We are searching for information on the Families of the Glenn of Aherlow including: Magner/Henneberry/Coveny/Fogarty/Kiely and Fruin Families from Galbally, County Limerick and Tipperary, Ireland. They settled near Waterbury and Bridgeport, CT during the 1840's and 1850's. Several members of the family moved to Will and Grundy counties in Illinois during the 1860's. We need your help. All relevant Magner and other Families of the Glenn information will be posted at no charge. This site has received a 3 Shamrock rating from Doras. This web site was established June 25, 1996, and is owned, hosted and designed by Clan Magner Association ™ and Ronald Magner Knowles. Member: Moultrie County Historical & Genealogy Society. Copyright RMK Research: 1965-2007. All rights reserved. Disclaimer No photos, text or information may be copied without permission. Send technical questions to: webmaster.